I really like it when you show meals that you can use bits of leftovers in easy. Could you do some more of those? Sure! We do meals like this all the time at our house. One of our favorites is what I like to call magic jambalaya. All you need is some rice, some cajun seasoning, some beans, and whatever leftovers you might have on hand. 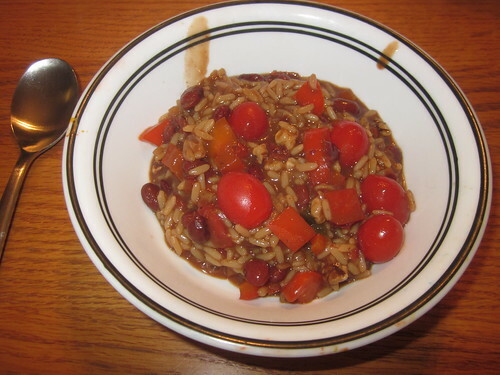 For my family, I usually use two cups of dried rice and a cup and a half of cooked beans, preferably kidney beans, but anything works. I also use a cajun spice mix, which is just equal amounts of cayenne pepper, paprika, black ground pepper, chili powder, garlic powder, and basil, with just a hint of thyme, ground mustard, and cloves. I store this all in a jar in the cupboard and, when I need it, I add it by the teaspoon to whatever I’m cooking. If it’s just for my kids and my wife and I, I don’t spice it real heavily – maybe just two teaspoons of the mix. If I know I’m the primary eater, I use five or six teaspoons. 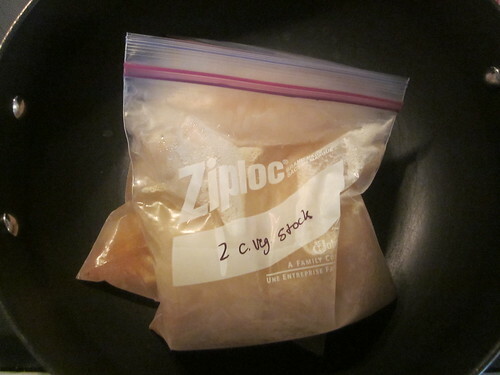 If you have vegetable stock, use that for the liquid. You’ll need a total of about four and a half cups of liquid to leave the mix really juicy, and if you live in a dry area, you may need to add more along the way. Aside from that, I use whatever I have left over from other meals. 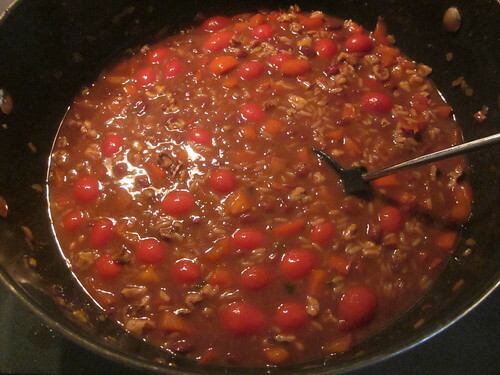 Below, I have some left over cherry tomatoes, a left over diced red bell pepper, some left over walnuts, and a bit of left over onion. Make other meals. Save the spare ingredients that seem like they’d fit. Sausage, chicken, peppers, beef, pork, onions, beans, potatoes, tomatoes, nuts – it’s all good. Make sure the meat is cooked first, however. Keep it in the fridge until you’re ready to use it. Essentially, all you have to do is cook the rice in the liquid to start with. Use four and a half cups of liquid for your two cups of rice and begin cooking according to the rice cooking directions. We make our own stock out of leftover vegetable scraps (skins, cores, unused bits, etc.). This makes the rice taste absolutely wonderful. In fact, it makes anything that you’d cook with water, like soups, taste tremendous. Once the rice is in the liquid and you’re at a low boil, add the other ingredients – the cajun seasoning plus whatever items you happen to have. Beans. Sausage. Chicken. The list goes on and on. As I mentioned above, we used a bit of onion, some red bell pepper, some cherry tomatoes, and some leftover walnuts for protein. Cook it in an open pot at a simmer for however long the rice suggests it should be cooked (it varies depending on the rice). If you need to add more liquid, do so. You’re better off having it very wet and nearly soup-like than having it dried out. When the rice is finished, the meal is finished. Serve and enjoy! Obviously, a meal like this is incredibly flexible. Many different kinds of vegetables will work (I really like okra in it, for example). Almost any kind of bean will work. Many kinds of rice will work. Different kinds of meats will work. My wife does things like tossing in squares of baker’s chocolate, even. Use what you have and don’t worry about making it “perfect” – each time you make it, it’ll be unique and delicious.